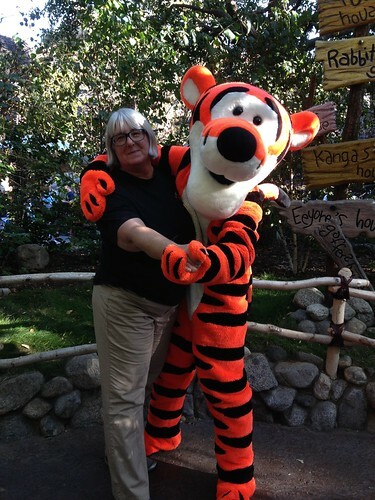 If you're on the Christmas card list, you got a card with a photo from my Disneyland trip. 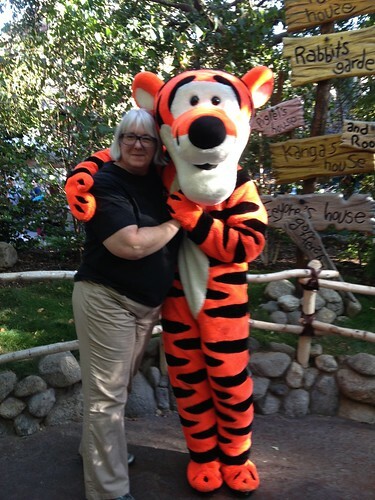 It was one of my goals to get some kind of photo from either BlizzCon or Disneyland to make personalized cards. 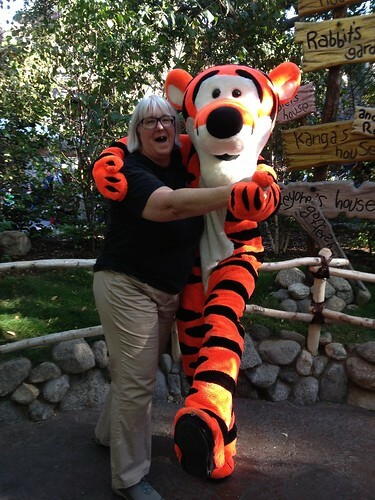 When Liz said you could meet Tigger, assuming he was out, well, that's who I wanted to have my photo taken with. We wound up waiting 20 minutes but it was worth it. Using my cell phone and my camera, Liz took quite a few photos. The cell phone camera has a darker color than the digital camera. These were good but when I compared them to the ones on the digital camera, I felt the color was better on the camera. I went with the last one in the series. The cell phone seemed to latch onto the dark of the area and enhance it. The background got lost in the shade. I liked the color and our positioning of the bottom photo. 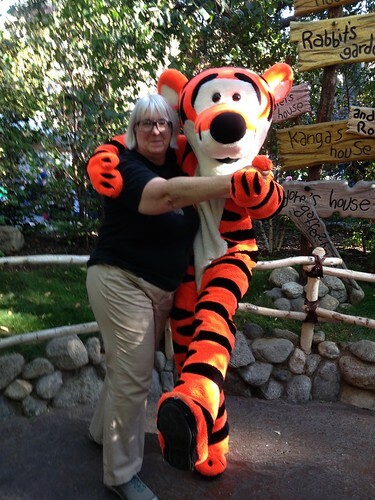 What you can't see is that my tee shirt had Tigger on it. He's always been my favorite Disney-fied character so it was exciting to get a photo. 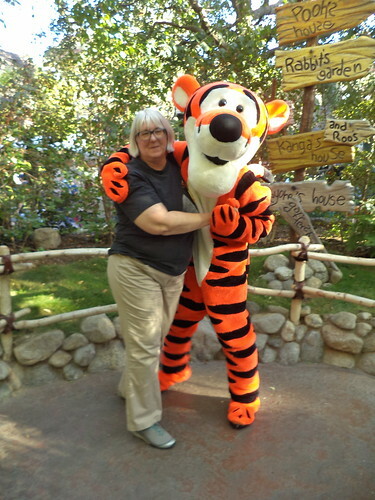 Pooh turned out to be just around the corner in his photo spot. 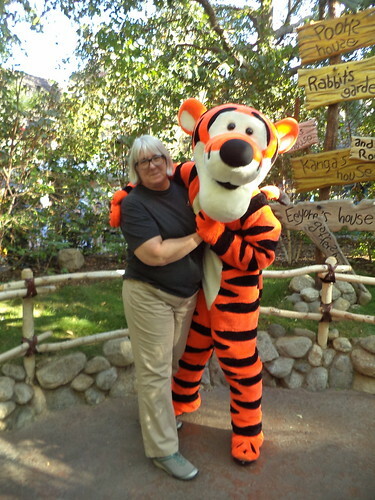 It was funny to see Tigger's line be twice as long as Pooh's. Making my own cards was a lot of fun. There is free software with the new printer so it was reasonably easy to print what I wanted. It has me looking ahead to this Christmas. What do I want to do for cards? I have a lot of regular cards I've accumulated over the years which would cover my needs. I wouldn't have to buy any this winter. And then, it snows. 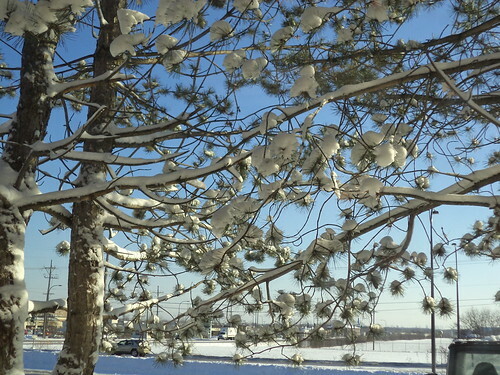 There is a pine tree outside my office window. I watch squirrels go up and down, chasing each other. I left one noon to get lunch after a morning of wet snowfall. I was greeted with these images. 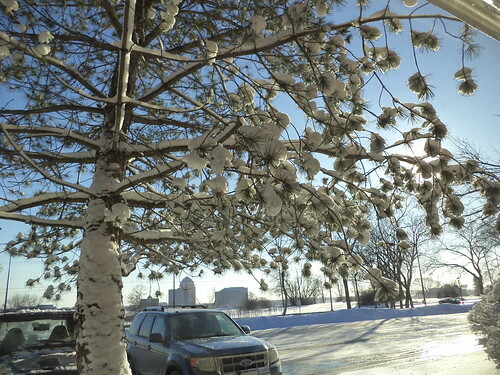 There are large pine cones on this tree. 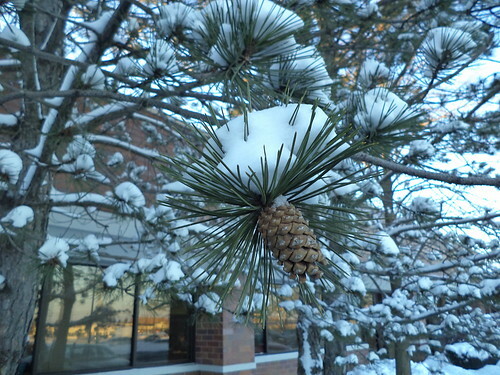 I'm not up on my identification of pines so I don't know what kind this is, but they make for great photos. I particularly like this photo below. If I was going to do a personalize card this Christmas, there is great potential in this photo. I don't spend a lot of time composing my photos. I'm very much a point and shoot person. Photos like this tend to be a happy accident. So, I will keep this in mind for the winter. Of course, there are 10 months between now and when I need to have cards. We'll see what other photos present themselves as card potential. 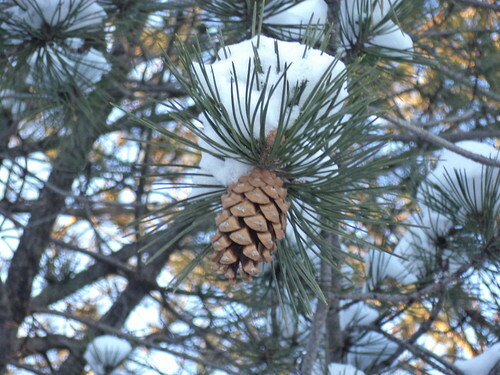 The pine cones are also really nice. Again, the last one highlights the pine cone much better.